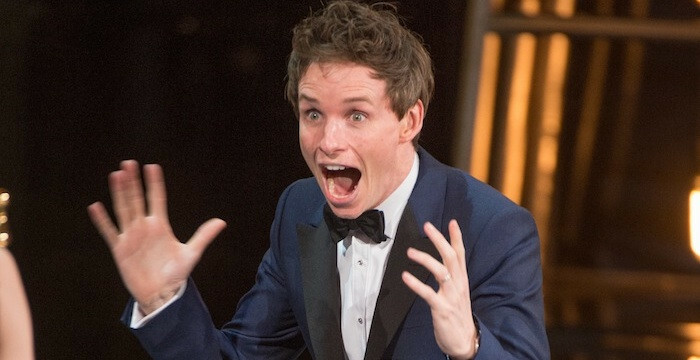 There's insincere, there's disingenuous, and then there's Eddie Redmayne, who celebrates his 34th birthday today. In an interview with British GQ, Redmayne revealed that he has on occasion paid the rent for drama students in London. "The greatest privilege that I had was that my parents lived in London. So when I was out of university and out of work for a year, working in a pub, I didn't pay rent. And I get letters from people trying to go to drama school and needing to pay their rent. And so that's something I occasionally do. It's impossibly expensive to live in London." Now, Redmayne is getting a lot of kudos for his noblesse oblige. MTV, the bastion of such stimulating intellectual fare as Jersey Shore and Teen Mom is besotted with his act of Mother Teresa-like generosity, literally calling him "the best human". There are many who think this news reveals a wonderful, altruistic, generally nice person, full of warmth and loving their neighbor. I'll grant that perhaps my own worldview is darker, more jaded, more cynical. However, let's go over a few things before we send over any requests for sainthood to Pope Francis on behalf of the future Sir Edward John David Redmayne, Lord Rottingham. Then again, that's just me. Perhaps I would hit on the idea of asking Idris Elba, another British actor who, unlike our illustrious Reds, wasn't to the manor born. Elba wanted to attend the National Youth Music Theater, but the cost was prohibitive to someone who grew up surrounded by drugs, gangs, and poverty. At 16, his life took an unexpected turn when The Prince's Trust, a network of charities under the auspices of HRH Charles, Prince of Wales, gave Elba a grant of approximate $21,000 U.S. (1,500 pounds). With that, his career was able to take off, and now we have a man whose performances in Mandela: Long Walk to Freedom, Beasts of No Nation, and Luther are themselves inspiring other real struggling actors. The Redmaynes invite us to eat cake. The idea that Eddie Redmayne 'struggled' in any way is equally astonishing if not downright laughable and even a little insulting to other actors who genuinely struggled and still struggle in pursuit of a drama dream. By his own admission, he lived with his parents when he was starting out as an actor. Nothing wrong with that: he is saving his money to pursue a goal. He makes special mention that he worked at a pub (or a waiter as The Guardian puts it). However, the impression one gets that he was really paying his dues in the day to return to bunk up with Mom and Dad is a little misleading. This home he went to after a long day pushing brooms and swilling beer was no East End council flat (housing complex in America) or some semi-detached home. It was a townhouse in the affluent Chelsea area valued at $3.66 million (2.5 million pounds). He and his family vacationed in their private villa in the south of France (which the Redmaynes still own but which you can rent for a mere 9,000 pounds a week, or $13,000 U.S.). In short, he was "struggling" in a home that at the very least had a ready stock of food in the fridge and pantry, heating and air conditioning, and hot and cold running water. This is also figuring that the Redmayne home had at least one servant around the house that could be called on by Master Edward for some service. I've known some apartments where the heating or electricity can be turned off, even when you've paid the rent or bill. Redmayne knows nothing of these struggles. He knows nothing of living hand-to-mouth, about worrying where his next meal will come from, about how he'll keep food and shelter when whatever acting gigs come his way are few, far between, and poorly paid. Yet here he is, touting his generosity by 'occasionally' (when the mood strikes him), doling out $3700 to someone who asked for it. For a man whose net worth in 2014 was over 3.5 million dollars, handing out what doesn't even come to even 1/100th of 1 percent of his net income can hardly be called 'generous'. It's like me suggesting I was generous because I put in a penny in the collection box. Not to brag, but at least I give my tithe from my net, not gross. Compared between us, even in my miniscule $25,000/year (net), I actually give more in charity than Redmayne, except I don't expect bows, applause, and Oscars for doing what Scripture asks of me. We are familiar with the struggle of the working class. I wonder whether it would be better for other posh actors (Benedict Cumberbatch and Tom Hiddleston are also from exceptionally privileged backgrounds who didn't have to worry about money save for when & where to spend it) to pool their resources & set up funds rather than send individual gifts to their fellow thespians. They are all in perfectly excellent financial positions to offer scholarships, grants, loans, and endowments to any school they wish, or create programs that will financially help other actors, writers, dancers, singers, or artists as they pursue their own dreams and follow in Cumberbatch or Redmayne's steps. Setting up something similar to The Prince's Trust (which gave Elba a chance, let alone the thousands of private individuals who have risen to better lives through the Prince of Wales' work) would I imagine be of great benefit to both parties. The Redmaynes & Cumberbatches of the world would have a ready system to help others as well as accountability as to where their money is being used (or perhaps misused). The recipients would have some security about the basic necessities of life. My feeling though is that Redmayne, Cumberbatch, or any other actor from a well-to-do family would not create a Redmayne's Trust. Individual charity is fine and commendable, but obviously it's the government (in other words, the taxpayer) who should be doling out moneys for others to pay for their food and shelter. Paying high ticket sales to see them perform in a play or a movie or for the tchotchkes with their likenesses on them (of which they get something for the right to use their likeness) isn't enough apparently for them to lend a helping hand. They need some other entity to do that. Now, maybe Redmayne gives more in terms of private, anonymous charitable giving. That is highly commendable. However, that being the case, if it were so why reveal this information at all? Why couldn't he keep his acts of generosity quiet, on the down low? It might be my Protestant worldview, but I have been led to believe that the admonishing from Matthew 6:1-4 should be a guiding principle when doing good for/to my fellow man. Here Redmayne is, 'casually' mentioning his charitable deed to a member of the press, and here I am, asking 'why mention it at all'? What purpose does it serve? Is it for him to receive 'glory from men'? Is it to promote himself as a thoughtful and benevolent figure? What purpose does it serve Redmayne for him to mention this little previously secret tidbit that he knew would be reported widely? Let us speculate what purpose Eddie Redmayne's formerly private acts of charity would serve if the news was disseminated at this particular time. for the Oscar at ALL! I also ask, 'why mention this now'? The timing of this revelation is curious, but timing is everything. This act of benevolence to other actors comes when he's in the throes of campaigning for a second consecutive Oscar for his work in The Danish Girl. This time, instead of the quadriplegic genius, he's now the transgender tortured artist (is it just me, or do both of those sound like Oscar-bait parodies). Redmayne now has decided that his calculated artifice will educate us simple cisgender folk about tolerance, acceptance, and the joys of identifying oneself as a woman while remaining anatomically a man. I confess to not being able to bring myself to watch The Danish Girl for two reasons: Eddie and Redmayne. The Danish Girl looks even more artificial, more coldly calculated, more shameless Oscar-whoring than The Theory of Everything (and given how whorish that film was, that's saying quite a lot). Redmayne can't count on his 'aw-shucks' persona to get him the win by charming the more 'senior' Academy members into voting for him. He can't count on being the 'fresh face' he was last year. He can't even count on the 'acting challenge' of playing transgender (Caitlyn Jenner, Laverne Cox, and Candys Cayne among others being the real thing). Cisgender actors playing transgender isn't considered the 'transcending film acting feat' that playing a man with no mobility was seen. Furthermore, unlike last year when Redmayne so deftly pushed his main competition Michael Keaton out of the way and sidelined potential spoiler Bradley Cooper to roll his way to Oscar gold, Redmayne faces at least two major competitors. One his left is Leonardo DiCaprio, who is seen as the frontrunner in an 'it's his turn now' for The Revenant. On his right is another well-to-do Brit, Michael Fassbender for Steve Jobs, who is now seen as the main spoiler for any DiCaprio Oscar loss. Redmayne is fast becoming an almost-ran, likely to receive a nomination but not as big a contender as last year, and certainly not the frontrunner by any stretch. And that's NOT taking into account any potential surprises come January 14 when the nominees are announced. A wide variety of nominees are out there: Michael Caine, Ian McKellen, Matt Damon, Johnny Depp, Bryan Cranston, Tom Hardy, Michael B. Jordan and I'd throw in Tom Courtenay for 45 Years as wild cards in a field that, like the Republican candidates for President, can shift in an instant with just a few votes. In short, Eddie Redmayne is not dominating the conversation, let alone the race. The fact that The Danish Girl, unlike The Theory of Nothing, isn't seen as a Best Picture nominee (or a weak one at that, what with Spotlight, The Big Short, and even Straight Outta Compton and Mad Max: Fury Road taking up the oxygen) weakens his own chances, a case of "No Best Picture, No Best Actor". If The Danish Girl doesn't get a Best Picture nomination, consider Redmayne's chances dead...or at least on life support with Leo or Mike about to pull the plug. Like any shrewd politician, whose insincerity is patently obvious, Eddie Redmayne knows that to win, he has to present a certain image. Last year, it was the slightly dazed, slightly befuddled youngster, one who seemed perpetually shocked that his little film could be so inspirational and moving to all (well, all save me, which found it cold and calculating, like some Presidential candidates I need not mention). He campaigned harder for his Oscar than anyone this side of Chill Wills, but unlike Wills, knew when to rein himself in. Now, Redmayne finds himself with few tricks up his sleeve. He isn't the It Boy this year. He faces an Oscar veteran who has lost five times (four for acting) and who is seen as being overdue. He faces more biopics and a wider and stronger field than last time round. He is in a film that doesn't have the 'inspirational' pull that the one he did last year. What could he do to put himself back in Academy voters good graces? Did he ever tell you about the time he paid an unknown acting student's rent out of the goodness of his heart? Did he also tell you that this news coming out at the same time he is campaigning to win a second Oscar is mere coincidence? Two last points. One: I don't begrudge Redmayne for coming from wealth. There is nothing wrong with being born into a wealthy family. You can be a good person with a lot of money just as you can be a bad person with very little money. I'm a firm capitalist and applaud the fact that the Redmaynes have built up a vast fortune to which they can give a touch of it back. Two: I don't see Eddie Redmayne's actions as being charitable or noble. I look to my mother for a better example. Just today, she hauled me out of the house to help her give groceries she'd been given at her church after Wednesday prayer service to a woman she found crying at the gas station. This woman said she had no money and children to feed. She also was visibly trembling from the cold. Mom went home, got a coat she no longer uses, and gave her that too. When I had coffee cake & milk with her later that evening, this woman, who lives off Social Security and what I can spare, told me she felt almost guilty for having so much. She has a home, food, and enough for her needs and an occasional want. She gave because she considers herself blessed. She seeks no fame, no applause, no glowing praise by MTV or anyone, not even me. The only praise she'd like is that of Christ, to tell her, "Well done, good and faithful servant". My Mom probably in her whole working life never made half of what Eddie Redmayne makes for 24 weeks work. Yet when it comes down to it, I think it is she, not he, who is the real emblem of generosity. She gives because she knows she has so, so very much (despite living on a pension). She also wouldn't think of mentioning this (and would be displeased I mentioned it here). Why does Eddie Redmayne give and why does he tell us? I'm sure the fact the Oscar race is going on at the same time he reveals his acts of private charity is merely coincidental.